The Fábos Conference on Landscape and Greenway Planning is held every three years to bring together experts who are influencing landscape planning, policy making and greenway planning from the local to international level. The papers contained in this book highlight recent trends and expand the literature about landscape and greenway planning and describe how different countries are approaching greenway planning and tailoring them to each country’s unique geographical, cultural, and political circumstances. Fábos, J.G., Lindhult, M., Ryan, R.L., & Jacknin, M. (Eds). 2013. 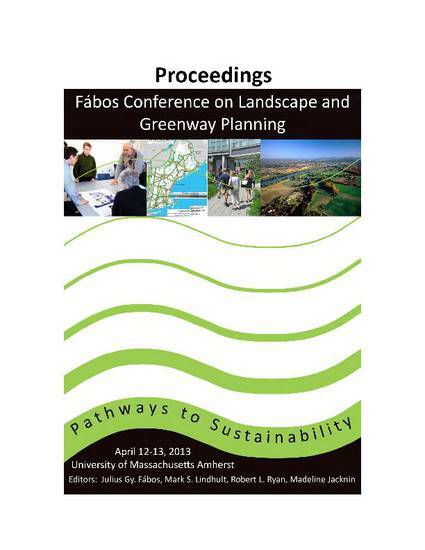 Proceedings of Fábos Conference on Landscape and Greenway Planning 2013:Pathways to Sustainability. University of Massachusetts, Amherst, April 12-13, 2013. Full papers. Amherst, MA: Department of Landscape Architecture and Regional Planning, University of Massachusetts, Amherst.